Thanks to people who have wished me a good visit. Yesterday (21 April) I only had time to visit Knut in the morning. I arrived at his place at 0905 and found him enjoying the morning sun and being photographed by a couple. He was a sandy white and is looking more and more like his father. He still has a very special expression and sniffed the air a lot. By about 0940 Knut had decided to settle down to a long snooze. The journalists are completely wrong about him needing public applause. A group of children with their teachers were calling "Knut, Knut! to him and he slept on happily. I went off to see the bears feeding at 1030. Marcus came a bit late and Lars and the ladies were getting impatient. Katyusha seems to be very keen on Lars, but Tosca still places herself behind him. Today I will spend until lunchtime with Knut and then go to the Tierpark after lunch to see Trolle and Aika. 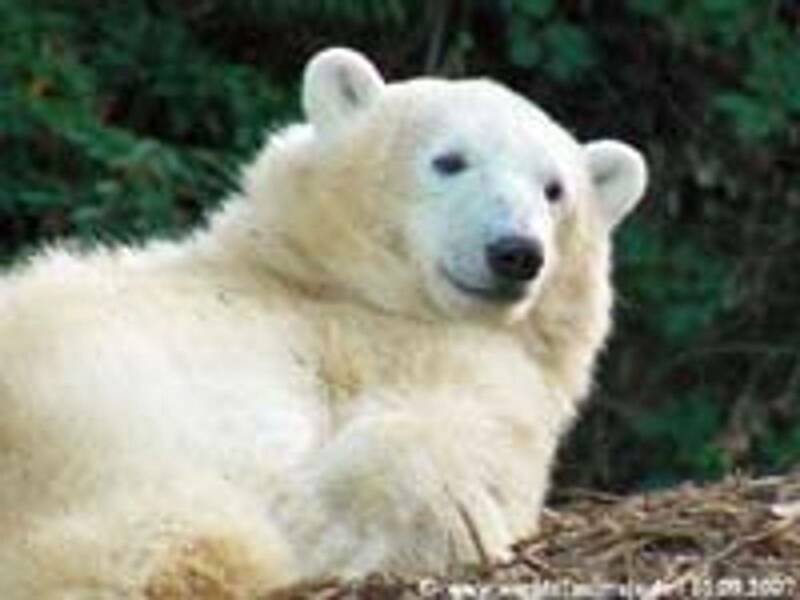 Knut forever in Berlin seems to be a nice idea, but the experts do not like it (shame). I am sitting doing this in a caff at the Friedrichstrasse station near where I used to have to go through East German border control when I was a press officer for a while in the 80s. Nice one. 1015 Dinner for Four (A German tradition on New Year's eve iso to show on TV "Dinner for One" an English comedy sketch which has never been shown in England for legal reasons which I can't go into): Lars is waiting, with Tosca behind him and Katyusha on a little island. I have learnt that it is Nancy that hates water and she seems to be the biggest female (her sister Hallensia is in Vienna?). 1030 Two zoo ladies arrive and we are treated to the "Dinner for Four". Someone should make this a video (I would, but I hate gadgets (unless the office mends them). 1415 Wait to see Knut receiving his various snacks. A large crowd has gathered. K is totally cool and relaxed (guess the Press is wrong again with the reports). 1430 Knut is fed and has marvelous range of stuff: bread rolls, carrots, fish, lettuce and of course, meat. He then puts on a great water show. 1500 Depart for East Berlin. 1530 Discover that London Transport must be running the show as the Underground (U Bahn) is out of action and I have to sit on a bus. 1600 Arrive at the Tierpark (East Berlin zoo). Favourite bears here. I love Troll and Aika. 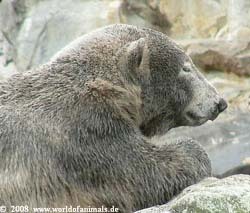 Troll is a male bear (18) born in Wuppertal. He is quite lazy and does not swim but looks good. Aika (26) is getting on in years, but today has been given a log to play with and puts on a great show of mock hunting. 1830 Aika and Troll are let in for the night. Chat to their keeper off the record, and leave for the West. Back in the Internet caff to begin the day before going to the Zoo to see Knut and the Gang of 4. Thanks to those who enjoyed the reports (sorry again for not having a camera but I travel light). I have enjoyed seeing Knut in particular and have some thoughts to share with those who are not lucky enough to have seen him for real. 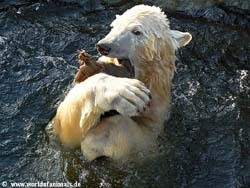 The marvelous photos and TV films do not manage to convey how special Knut is. Only when you see him for an hour or so do you realise how stable and balanced his temperament is. The Berlin Zoo team have produced a top bear and he looks very good at the moment. Must get off to catch the feeding of the 4 (the same procedure every day, but it never fails to please). I gather that Dinner for One was made in Hamburg in the 60s (not long after the Beatles were there). The scene with a typical English butler and grand lady of the house pretending that they have important guests is matched with lovely slapstick as the butler gets drunker and drunker. I suppose it is that that makes it such a New Year hit. Found another Internet (Sidewalk express) in a new shopping centre in East Berlin. Guess what they have a marvelous model railway layout here and in the middle is the Zoo, and yes, Knut is there too, being photoed. This morning Knut was in a lazy mood. He camouflaged himself and hid himself in a niche in the rocks of his enclosure to sleep, just as a wild polar would do. The gang of 4 were also on good form. This time, Tosca tried to beat Lars to the island. When the meat was found, Nancy noted that a piece of meat had sunk to the bottom of the pool. When the others went to have their bread rolls and nuts she dived to get the meat. Zoo: A marvelous ape and monkey house. A super Hippo family. Tierpark: More elephants than you can imagine. Marvelous tigers and rare wild cats. Unfortunately I do not have my own website. I have relied on this excellent blog and some of the links. I must thank all for the excellent reports. On Wednesday afternoon I returned at 1415 (Imust stick around between 1100 and 1300 today as Knut seems to be active then too). Knut was waiting to be fed and prowling his enclosure, oblivious to the large crown in front of him, using his keen sense of smell. When the keepers arrived, Knut did what Lars always does and stood up proud and tall. However, when he eats, he still has that look he had as a cub, which TD said means he thinks someone is always after his food. These days he is right, as there are always ravens around waiting. He also gives his "klageruf" which is no longer a bleat, but a soft throaty growl. Afterwards I went to the enclosure to see the Gang of 4. Katyusha and Tosca were diving to find food left over from the morning feed. Lars was flaked out in the sun. Nancy had positioned herself by the gates to the inside cages and was obviously hoping to be let in. She is always so clean! Went back to Knut and sat in the sun watching him snooze. My last day today. If I survive London's Terminal 5 (Next time Lufthansa-sorry BA) I will write some more from the Library in Kidlington where I normally watch this blog. Knut is not yesterday (Flocke's Poster quote) he is still the Boss (with apologies to B Springsteen Esq, who would I am sure understand! An exciting morning at the zoo this morning. 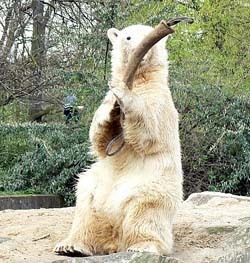 Knut was initially described as "restíng", while two workmen had replaced a glass screen that Knut had managed to scratch. By 11 he had reappeared and was performing with his various balls (blue with white spots and orange) for the large crowd, including some nice people who come to this Blog. 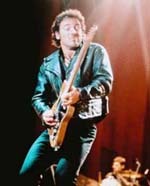 Then a sensation. Knut is known of course for loving to roll in the sand. However, as Paris would say, black is the new white! Knut found enough mud to turn himself the same colour as the nearby black bears. He even responded when I called Knut, Knut as if he to say "You want dirty, I will give you dirty". Berlin is known as a media city and Knut has become a real professional. Nuremberg have been advertising a small, white fluffy Flocke and using the slogan (tongue in cheek of course-Franconian humour!) "´Knut was yesterday". Well, Knut showed them that white and small is so yesterday. A fantastic leaving present. I am going back in a monent to see the big fella, but thought you would want to get this one live! Oh and the ´Gang of 4 did not get off lightly today either. Marcus was on the shift and he stands no nonsense (either from bears or visitors! )and so Lars had to keep diving for his fish, rather than lazily catching them standing up.